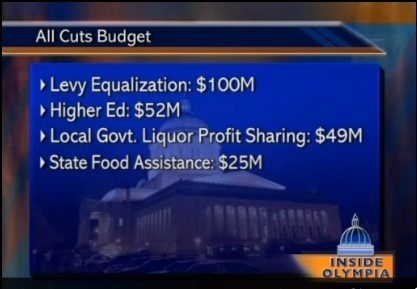 Outgoing Governor Gregoire has proposed two budgets, as described in the video Inside Olympia by TVW. 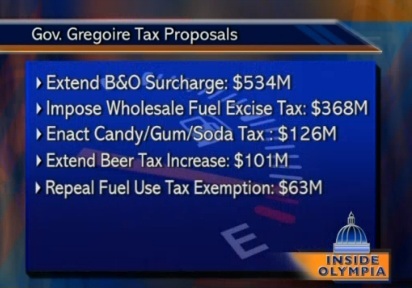 Gregoire’s second budget raises revenue from an excise tax on wholesale fuel, taxes on candy and beer, an increase in the B&O tax on services (doctors and lawyers), and a repeal of a fuel tax exemption. 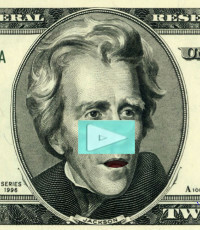 House Budget Chair Ross Hunter discusses the budget in the second half of the video. Hunter (along with Governor Gregoire) believes that trying do a budget without new revenue would be illegal or immoral. The budget writers are constrained, by the McCleary Supreme Court decision, to adequately fund education. This year there’s a billion dollar or so of new obligation to fund education; eventually, there’ll be 3 billion dollars of new obligation. This session it’s the State Senate’s turn to propose a budget first. Hunter says that though the incoming governor, the Republicans and the State Senate under Rodney Tom think they can get by without new revenue, Hunter believes they will have an epiphany and realize they need new revenue. I suggest to Hunter and Gregoire: why not raise revenue by cutting Microsoft’s billion dollars a year tax break? Microsoft is one of the richest companies in the world, and rather than hiring Americans, it hires tends of thousands of overseas computer specialists to staff its Redomnd-area offices. Why should Microsoft get such large tax breaks? Is it politically impossible to cut them? 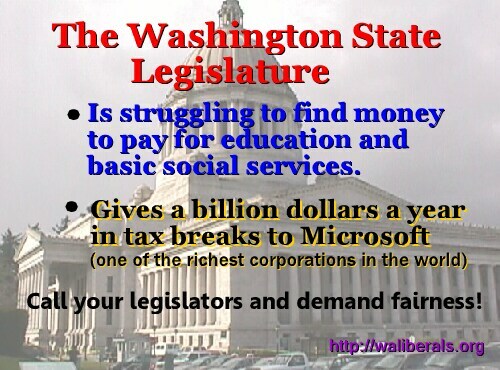 Without tax revenue to pay for education, how can the state educate the workers that Microsoft needs to hire? 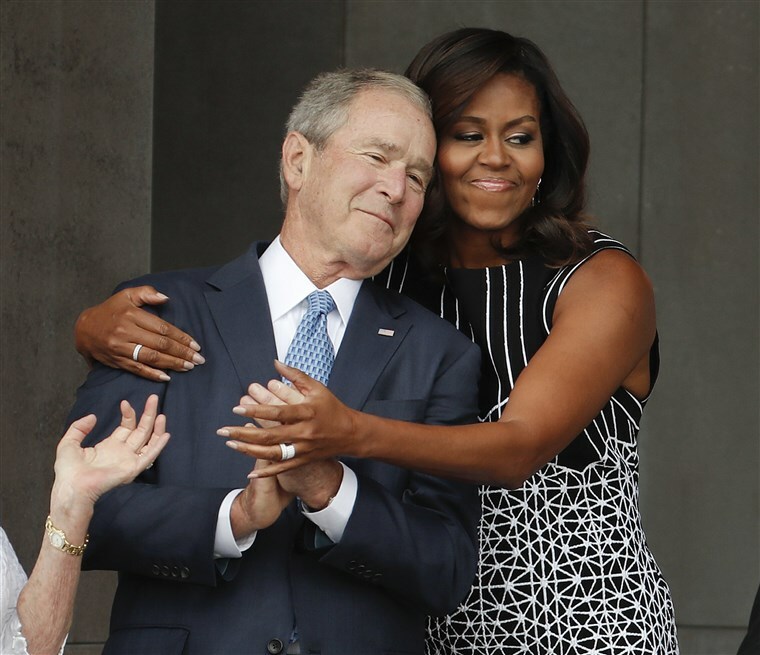 See also Microsoft Wins Nevada Royalty Tax Cut and Tax Amnesty; Reports Record Revenue and Microsoft Tax Scam Costs our State $1 Billion per year!. The situation may be similar to the case of Big Oil, which receives billions in federal subsidies despite, or because of, its extreme wealth. Of course, another option is to institute a tax on capital gains. That would be less regressive than a tax on candy and beer. 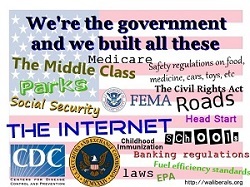 But, overall, I applaud Gov. Gregoire’s honesty about the need to raise revenue, and I applaud the fact that most of the taxes she proposes are less regressive. I wish that she would have pushed for new revenue earlier in her tenure as governor! 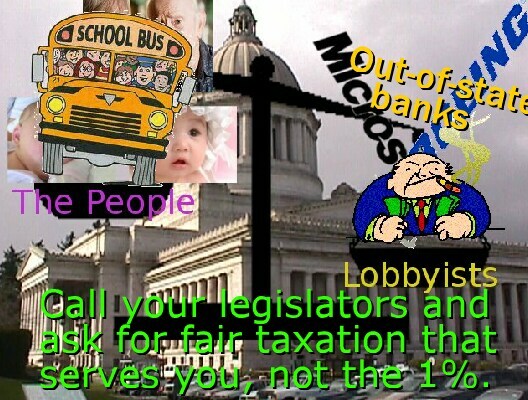 The public needs to be educated about the ways in which they vote against their own interest when they oppose income taxes and when they support Tim Eyman initiatives. On his facebook page Hunter once expressed sympathy with the Simpson Bowles’ commission proposal to cut Social Security, saying that we don’t want to become like Greece. But in the above video, Hunter sounds progressive, humane, and competent.